Let's all give a warm welcome to Ally Malinenko, author of Lizzy Speare and the Cursed Tomb! This self proclaimed Bardolator lives in Brooklyn and has also released a poetry collection, The Wanting Bone. Her knack for storytelling and love of writing has carried her not only into the realms of poetry, but into children's literature as well. 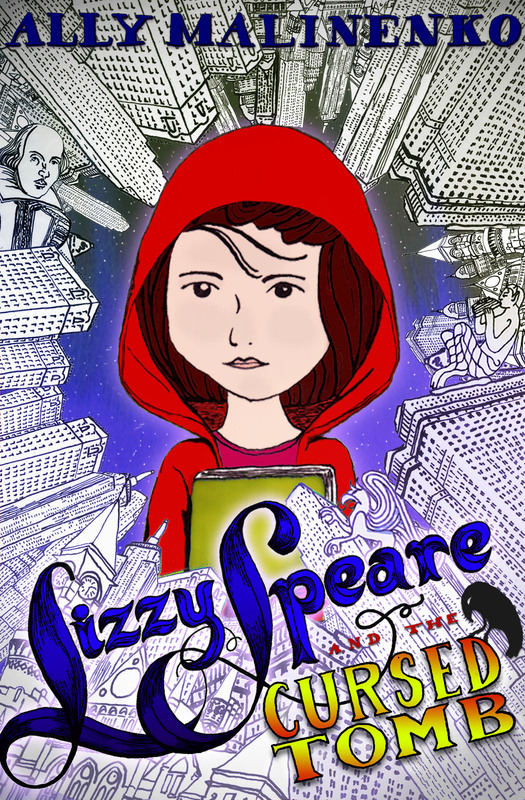 Lizzy Speare and the Cursed Tomb is the first in her series, and with it's adventurous antics and animated characters, it's bound to be a success! Then Lizzy and her best friend Sammy are kidnapped, awakening in the faraway land of Manhattan. Their host is Jonathan Muse, whose job is to protect Lizzy from becoming the latest victim in a family feud going back nearly five hundred years. Is that why the mysterious, eye patch-wearing Dmitri Marlowe is after her? (Spoiler Alert 2—he’s the last living descendent of Christopher Marlowe, a friend and rival of Shakespeare’s. But keep it to yourself!) Is Marlowe after Lizzy’s family fortune rumored to be kept in the tomb of that bald guy with the goatee? Does he seek artistic immortality? Or Revenge (with a capital R) for a death long, long ago? Thrilled? Excited? Eager to read? You bet'cha! I interviewed Ally to learn more! -It’s quite evident that you have a great love for The Bard, has there been anyone or anything else that inspired you to become a writer? Oh definitely. I get ideas and inspiration from nearly everything I read. But the very first time I realized that writing was even a job and that books were created by someone (instead of just appearing at the library by magic) was when I read C.S. Lewis' Chronicles of Narnia. As young girl, that story blew the doors off of any inhibitions I could have had about being a writer. It was at that moment that I said, yes, I want to do this too. Other big inspirational writers for me are Katherine Patterson and Madeline L'Engle. The other thing that inspired me to become a writer is that I am a storyteller by nature. I used to read books and then tell all my friends what happened in each book even if they didn't ask. Clearly I had very patient friends! I think for me, the line between real and not real has always been a little fuzzy. I already want to believe. Having that sense of wonder makes storytelling and writing fantasy easier. -Do you have any specific favorite plays or sonnets from Shakespeare? Hamlet is definitely my all time favorite and probably the one I have read the most. Midsummer Nights Dream, which is Lizzy's favorite, is a close second. I adore his sonnets and actually was given a very large poster with all the sonnets that I had framed and hung in the living room. It's lovely to walk past such phrases as "shall I compare thee to a summer's day? Thou art more lovely and more temperate: Rough winds do shake the darling buds of May, and summer' lease hath all too short a date." You can't have a bad day when you get to read that on your way out the door. I have attempted to memorize them but so far I've only got snippets here and there and I keep squishing one line from one poem with another line from another poem. Indeed I am no Bard! -Do you suppose you could write a quick sonnet summarizing your book? Just kidding. That’s Jabborwocky. Okay, I'll give you 10 syllables and the ab/ab/cd/cd scheme but I can't do internal rhyme and iambic pentameter is HARD. Jonathan Muse said he’s "at your service"
Sammy can come too." Prithee nice offer! But so far from home Lizzy was nervous. and he will not rest till he has revenge. The play is writ. Will our hero avenge? Oh! Fingers crossed Lizzy's life she will keep. The curtain falls, Lizzy, what shall you do? Oh my that was terrible! But also terribly fun! I think we'll have to leave the sonnets to the Bard himself. -What has ever gotten you out of a bad case of writer’s block? -What books have influenced you the most in life? The Narnia books, were a huge influence and so was Bridge to Terabithia and Wrinkle in Time. Those were top picks when I was younger and I read them over and over again till the covers fell of. As I got older the narrative structure of the Outsiders deeply moved me. When I stepped out into the bright sunlight from the darkness of the movie house, I had just two things on my mind: Paul Newman and a ride home. That's fantastic! Great opener and my teenage mind exploded when it was the last line. Once I hit my 20's I wrote a lot of poetry and was really influenced by Anne Sexton but as for stories, Salinger pretty much ruled my life, specifically Franny and Zooey. Fantasy-wise some of the more influential books I read when I was younger were Watership Down, NeverEnding Story, The Last Unicorn and Mrs. Frisby and the Rats of Nimh. And more recently, the Lemony Snicket series and of course, the great and powerful Harry. I'm reading the Burning of Isobel Key by Jen McConnel which I'm loving. I just recently finished Cloud Atlas by David Mitchell which was fantastic and now the Wachowskis are making a movie out of it which I will definitely be seeing. I'm feeling the itch for the Bard coming on so I think it's time to crack open my complete Shakespeare set and read some plays. The fall is a great time for Shakespeare. -Are you working on any current projects? -Can you share a little of it with us? Sure. Lizzy is back for her second adventure along with Jonathan and Sammy and Cleo and whole host of new characters. I don't want to give away too much but let's say that Marlowe is back with much bigger and more rotten plans. Plus you'll get to spend some time with Balthazar and Gwen in the past and find out how Rupert became involved, why Marlowe was imprisoned and the danger that is contained in the Hall of Hecate. The second book, The Chess Book, is about brainwashing and time travel and young love and street kids and one messed up game of chess. -Who designed your book cover? Sara Gable did. My publisher works with her. Didn't she do a fantastic job? She's absolutely delightful and was great to work with. I hope she’ do the second (and third) book too! -Are there any messages that you want your readers to grasp? 1. Families are messy and stitched together with love. Never ever turn your back on love. 3. Trust in your friends but always trust yourself. -Did you learn anything from writing this book? I learned a lot. This is the first novel I've ever written and I learned exactly what it takes to get through such an undertaking – Work. A lot of it. More work than I expected. When people get things published it always seemed like it was easy - they came up with a great idea, named some characters, scratched the whole thing off and sent it out. Volia! A book! But that is not at all what it's like. I'm not particularly good at planning so I would just write whatever came to mind that morning. I'm a pantser - as in fly by the seat of my pants-er. So after making up whatever I wanted I then had to go back and squeeze and ram and prod and pull it into a cohesive story. It wasn't easy to do. And there is no way I could have done it alone. I had everyone I could read this book in a myriad of stages - back when Lizzy was much younger and had a different name and things ended much differently than they do now - and everyone helped me pull it together. I'm honored to have such a great support system and I just hope that I didn't punch my ticket on favors. Cause I'll have a new first draft for the second book soon! Isn't she awesome! Such a great personality and sense of humor! It's so wonderful to see she's inspired by the books she has read growing up and now she's doing the same for our younger generation. So go check out Lizzy Speare and the Cursed Tomb, because as Malinenko says, "The fall is a great time for Shakespeare"